Pumpkin Spice cookies, cake, and syrup. Pumpkin Spice Fettuccini (I don't even know how to serve that) AND! Now before you decide to string me up as a heretic, please understand. 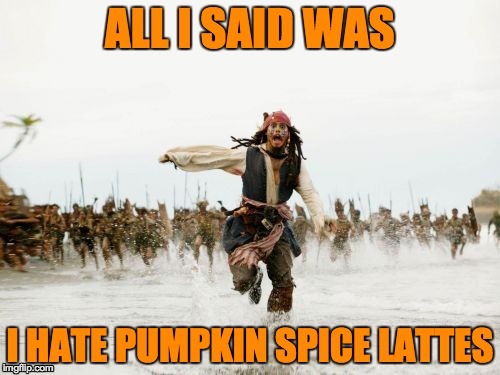 If you like Pumpkin Spice - that's ok. Even I have nothing against the flavor of Pumpkin Spice. 1 Cor 6:12 “All things are lawful for me,” but not all things are helpful. “All things are lawful for me,” but I will not be dominated by anything. Paul made it clear. Just because it's legal doesn't mean you should do it. Don't be dominated or mastered by anything. There is only one Master, and His name is Jesus. We serve Him. We do not serve addictions, bad attitudes or behavior. We do not serve money, this world or our own lusts. We serve Him and Him alone.